Soup happens to be the defacto vote for a quick appetiser for a weekend meal. Although I would like to make it (read eat it everyday), I am quite pleased to see over 15 varieties of soup already on this blog, and some more to be posted. 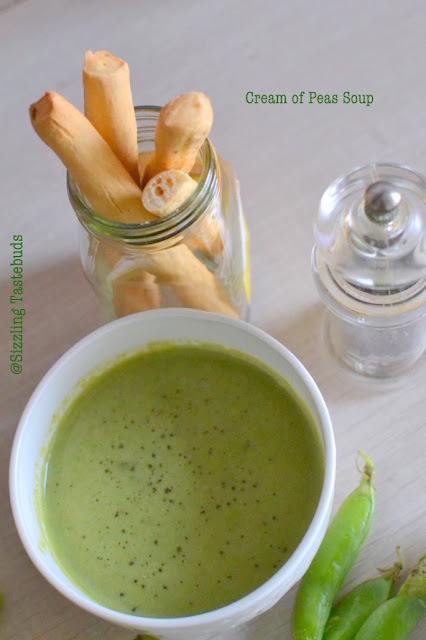 Today's version is a easy, nutritious and healthy soup that can be made for toddlers or even pre-schoolers (dear sister - hope you are reading this !). Cream used here is optional, and can be actually made vegan too. Read notes at the end of this post for more details. If you are a soup lover like my family, do check out the following options, and let me know what kind of soup your family likes. Let's get to make today's soup. I used fresh green peas but I guess it works with Frozen peas as well, but the taste would vary. You can add a handful of cooked rice and puree it with the peas for a wholesome meal for toddlers / pre-schoolers. Else, you may add 3 tsp of mashed potatoes in place of rice. Pressure cook peas with a pinch of salt and sugar with 1/2 cup water and the blanched almonds for 2 whistles. Or simply boil them till tender. Cool and puree. Do NOT strain. In a soup pot, simmer veg stock with salt and pepper. Add the almond meal now if not using blanched almonds. stir in the Peas puree. Let it simmer. tip in the cream and the milk. Finish with cracked pepper & Serve hot with croutons or any warm bread. What a pretty looking soup . Love the pastel green , it looks so fresh ! 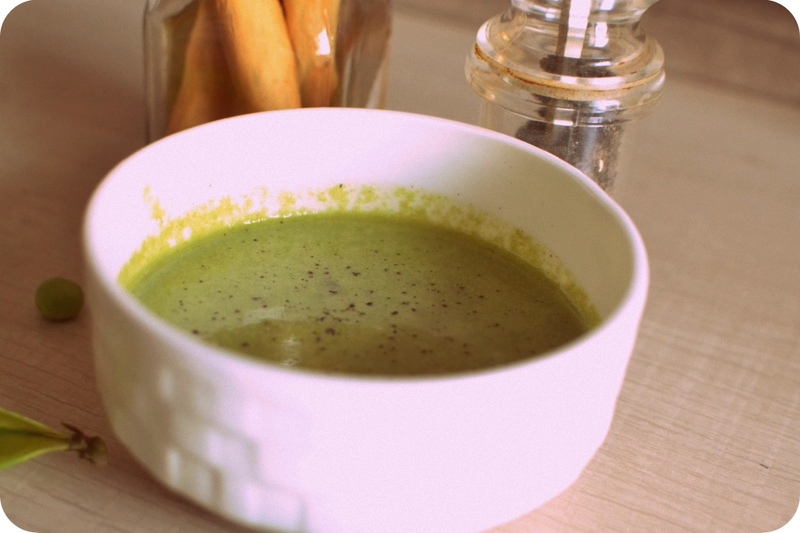 It definitely is a tempting soup and could easily pass off as a dinner . The color looks so pleasing. We love soups. Will have to make green peas soup. Am sure the kids will enjoy their bowl of goodness. Fantastic looking soup and I am impressed that you have so many already on the blog!..very good.. This is lovely. I like the use of almonds in place of cream. The color is beautiful. Have never used Almond meal in soup.. Love this version.. 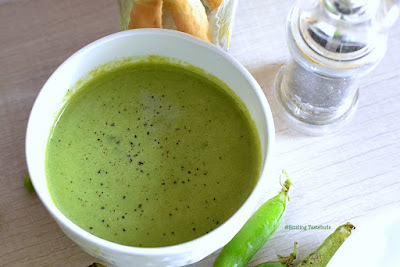 So creamy and delicious..
Soup looks so creamy and delicious.I love green peas soup a lot.. I have never ever tried peas soup. I guess it's time I should give it a try, looking at your post I am tempted. This time your series is all about vibrant colors as well, I guess :-). Love this one too! I totally agree with you regarding the soup. Can have it anytime. This is one such creamy and yummy soup. Love the addition of almond meal. Soup looks absolutely creamy and very delicious. The addition of almonds makes this shorba more interesting. I make a lot of soups at home but till now have not tried peas soup as I've always thought the colour may not come out right and that would not look appetizing at all. However, looking at your soup, I'm tempted to make pea soup. Love the colour. This is an interesting soup as I haven't tried making soup with peas. It looks divine and those bread sticks nearby are just too tempting.. I guess every one of us tried a hand at this peas soup this mega marathon. Lovely color.